The fourth international conference on Geographic Object-Based Image Analysis took place in Rio de Janeiro from 7 to 9 May with more than 160 participants.. Following the successful meetings held in Salzburg, Austria (2006); Calgary, Canada (2008); and Ghent, Belgium (2010), the biannual international conference on GEOBIA could reach South America, demonstrating the world-wide interest in the development of a set of concepts, methods and applications related to this emerging field. Dr. Blaschke highlighted in his talk GEOBIA’s key theoretical and methodological foundations, trends and research challenges. 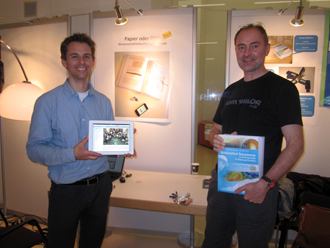 The nation-wide science promoting event “Lange Nacht der Forschung 2012” (LNF 2012, April 27, 2012, Aula der Wissenschaften,) was a welcome environment for presenting some advantages of full-digital publishing to a broad public by the ÖAW-GIScience Institute. September 5-9 2011, the world cultural heritage city of Salzburg was the setting for the annual conference of the International Association of Mathematical Geosciences (IAMG, www.iamg.org). Following the go-green idea for conferences, peer-reviewed extended abstracts were distributed to attendees on USB memory sticks; by the end of 2011, proceedings have been made publicly available via www.cogeo.at as open access, :doi referenced publications. To get an idea of the physical volume of scientific material produced for IAMG2011, a very small number (20 pieces) of conference proceedings was printed in traditional fashion: the immense book comprises about 1550 A4-format pages and has a weight of more than 3kg. The associated PDF includes some flashlights of our LNF 2012 presentation in the Austrian Academy of Sciences premises in Vienna (material in German).